I love dollar stores. And I love sprucing up basic picture frames. I especially love sprucing up dollar store frames. Picture frames should never be left in their original state. That is my motto! : ) I’ve done a transformation on this picture frame in the living room and this picture frame in the play room. 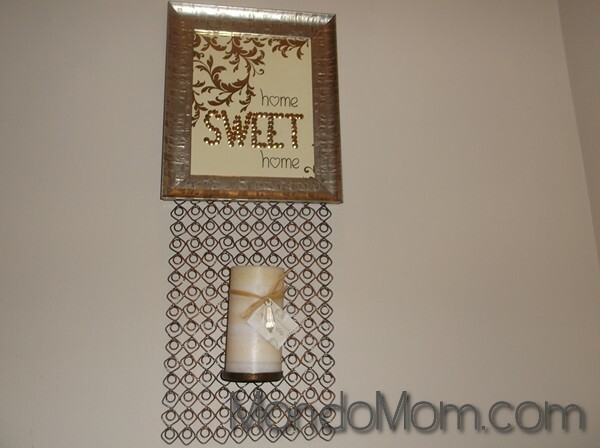 It’s a cheap, easy way to personalize your space and make a big statement at the same time. 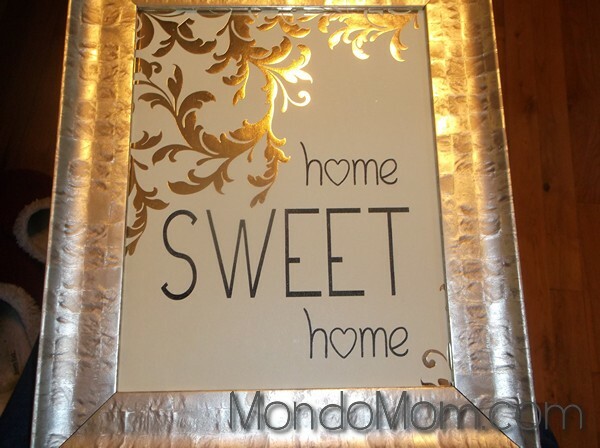 And I have plenty more ideas coming on picture frame ideas and other DIY wall art ideas. I got this bronze picture frame from a Dollar Tree a while ago, but it was uninspiring and needed a new life. It used to hold an old photo, but I needed to revitalize its use. 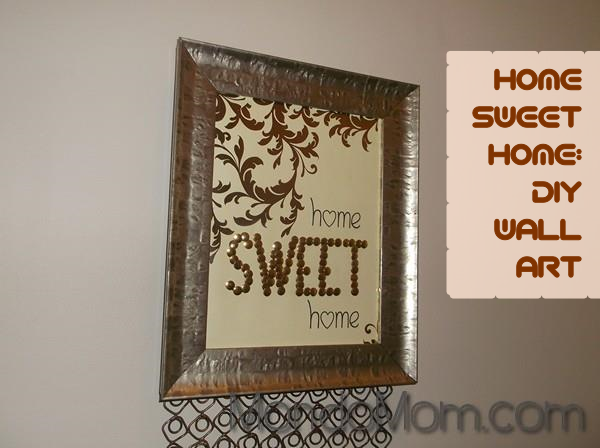 I’ve been thinking our entry way could use a little primping for a while now and the thought of incorporating the phrase ‘Home Sweet Home’ came to me. And once I started playing around with different fonts and sizes, I thought I could add a little dimension to the word Sweet for added impact. I could use Dollar Tree thumbtacks- perfect! I love how this came out, and it was so easy! 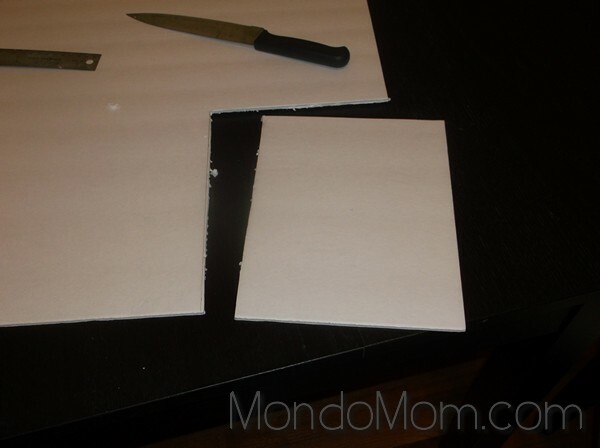 Cut your scrapbook paper to fit your frame. 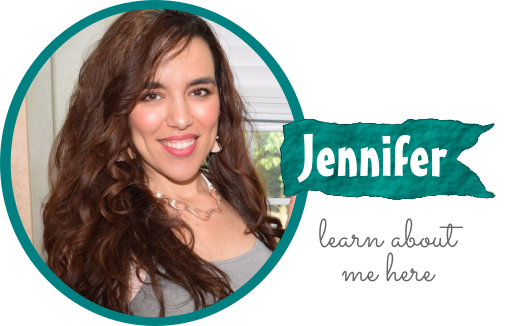 I used a sheet of scrapbook paper with a large embossed graphic on one corner of the sheet. Position your phrase in a word processing program so that the phrase complements the position of any designs on your sheet. I positioned my phrase on the opposite corner of the sheet for visual balance and symmetry. Print the phrase out on the scrapbook paper and set aside. Take the picture frame apart. Cut a piece of foam board (I used one from the Dollar Tree) that will fit inside the frame and replace the cardboard backing in the frame with this foam board. Reassemble the picture frame. 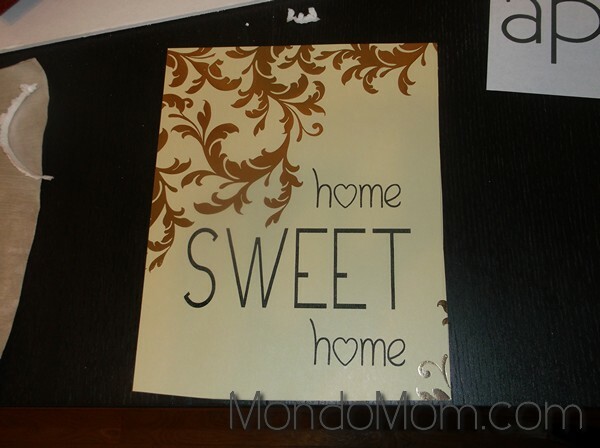 Include the back piece (that contains the hanger), the foam board, and the printed scrapbook paper on the front. Do not put the glass back in the frame. Use thumbtacks on an accent word to bring a little dimensionality to your piece. 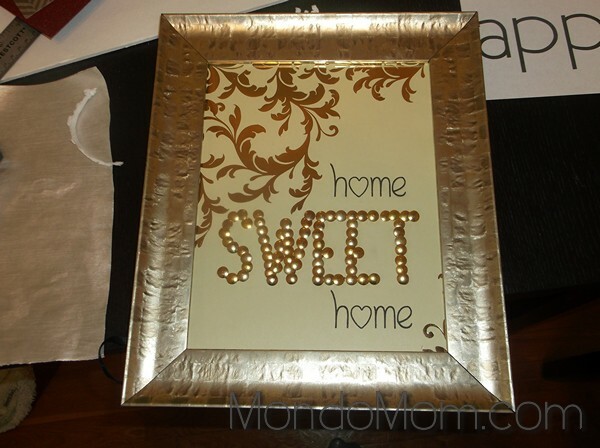 I used thumbtacks on the word Sweet. Use the printed word as a guideline to stay in straight lines and hide the word underneath. Hang up your pretty DIY wall art! *TIP: For the word that you will be accenting with thumb tacks, play around with the font so that the letters are large enough and set far apart enough. Otherwise, the thumb tacks from one letter will overlap those from the next letter too much, and the word will become unreadable. I’m really happy with how this came out. I’m thinking of doing something similar in the playroom for the girls! Check out some of my other playroom transformations: my stuffed animal storage and my gallery wall of books. Great tutorial! I love transforming picture frames and things that are originally so…blah. I loved your tutorial. And your frame turned out great! 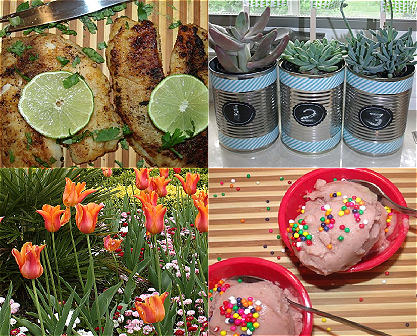 I love seeing new ideas for homemade artwork and decor!